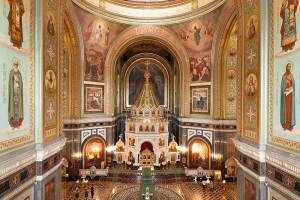 Completed in 2000 to replace the original cathedral destroyed by Stalin in 1931, Moscow’s Cathedral of Christ the Saviour is the world’s tallest Orthodox cathedral. It features a vaulted ceiling and hard walls that create reverberation times of over 10 seconds. To improve clarity for its speech and music programming, the cathedral recently upgraded to the new steerable CAL™ column array loudspeakers from Meyer Sound. "The long reverberation times together with the limited space allowed for loudspeakers dictated use of a high-quality column loudspeaker," says Valeriy Babin, project engineer for Theatre Techniques and Technology (TTT), the Moscow-based systems integrator. "By optimizing the beam steering angles of the CAL loudspeakers, we were able to greatly reduce the reflections and enhance overall clarity." The new system comprises two CAL 96 and six CAL 32 loudspeakers each colour-matched and flush-mounted to the wall for minimal visual intrusion. Using Compass control software, the operator can adjust the vertical beamwidth and downward tilt of each CAL loudspeaker to precisely target only the audience areas in the irregular, T-shaped worshippers’ nave. The cathedral has an estimated standing capacity of 10,000. 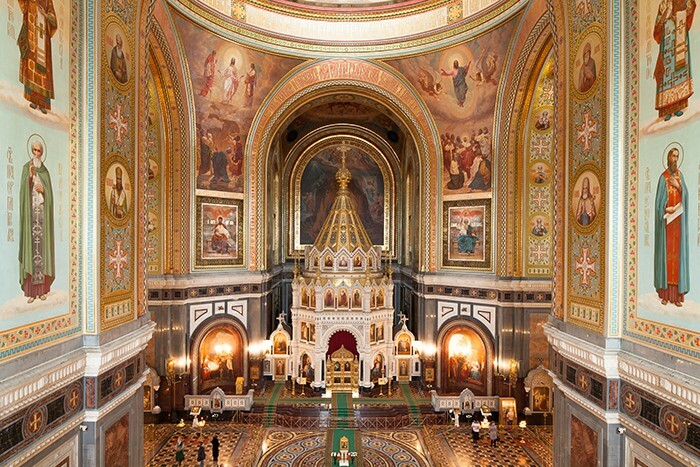 "When upgrading the audio system, we gave special emphasis to clarity of speech during worship services," states Roman Demidov, head of the Communication Department of the Cathedral of Christ the Savior Trust. "The CAL system accomplishes this quite successfully, and the quality of its music reproduction is excellent as well. Now the sound is more evenly distributed around the perimeter, and the improvement has been noticed and appreciated by the priests and the parishioners." The audio system upgrade by TTT also includes four UPJ-1P VariO loudspeakers as choir monitors. In 2008, TTT installed a Meyer Sound M’elodie line array loudspeaker system in the 1,300-seat Hall of Church Councils at the base of the cathedral. Satisfaction with the M’elodie system led to the CAL installation in the latest upgrade, according to Demidov.